New technologies, automation and especially Artificial Intelligence, is leading to wide scale job replacement. Many businesses are looking to employ new technologies to maintain competitive advantage, but few are considering the scale and social impact of job losses. This event will explore employment options (and opportunities) in a world of automation and Artificial Intelligence and the expert panel will discuss how business, governments and society should reframe their thinking around the future of jobs. 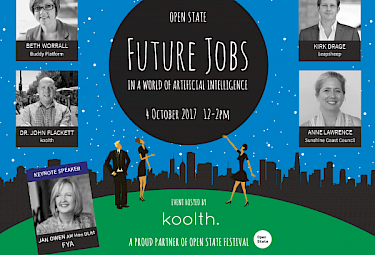 koolth and AiLab are really proud to partner with Open State to present our exciting event 'Future Jobs in a World of Artificial Intelligence' as part of the Open State Festival. This event will include a panel of leading figures that will discuss the future employment options in a world in which Artificial Intelligence and automation displaces millions of jobs. We are also excited to launch online registrations for our new AiLab at this event. Our wonderful speakers/panel (Jan, Beth, Anne and Kirk), Open State, the GoGo event team, our event supporters and to everyone that attended. We're thrilled to say that the event was sold out and we had a full house of people filling the Open State Dome. Jan is a highly regarded social entrepreneur, innovator, influencer and author who has spent the past 25 years growing Australia's youth, social enterprise and innovation sectors. In 2012 she was named Australia's inaugural Australian Financial Review and Westpac Woman of Influence; in 2014 she received the Doctor of Letters (honoris causa) from the University of Sydney; and was awarded membership to the Order of Australia in 2000. She is the author of Every Childhood Lasts a Lifetime (1996) and The Future Chasers (2014). Jan is the CEO of the Foundation for Young Australians and YLab, the global youth futures lab. Her lifelong mission is to unleash the potential of young people to lead positive change in the world. Artificial Intelligence is John's passion and has been an integral part of his career via teaching, research, business and education. An expert in his field, John achieved his a PhD in Artificial Intelligence (Machine Learning & Natural Language Processing) in 2005. With 20+ years' experience in AI, he's worked in a wide range of industries (including banking, engineering & education) and was previously a Senior Academic in the UK for 10 years teaching masters & undergraduate Artificial Intelligence and undergraduate Computer Studies & Software Engineering. 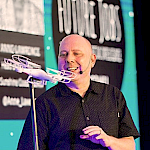 An international AI speaker for many years, John runs workshops & presents at events across the world speaking about AI, future jobs and emerging technology. View John’s full profile on AiLab. Challenging, eclectic and enjoyable is how Beth Worrall describes her career to date – having held senior roles spanning technology, banking, health, resources, engineering, government and social entrepreneurship. An aspiring “expert generalist" Beth has primarily worked in communications, corporate responsibility and sustainability in Australia and the UK. She's now Marketing Manager for Adelaide based internet of things business, Buddy Platform – a perfect spot for a self confessed “smart cities nerd”. As a mentor of young people and a mother of a toddler, Beth cares passionately about the future of work. What will the future hold? How do we prepare our children? What are the risks but, more importantly, what are the opportunities? Currently Head of Industry Development within the Economic Development Branch at Sunshine Coast Council, Anne’s role is to help foster and grow Sunshine Coast’s high-value industry sectors, in partnership with the business community. Anne has a particular focus on innovation and entrepreneurship as well as the digital economy, and has led the creation of a variety of programs to future proof the region. With businesses predominantly in the health, education and tourism sectors, the Sunshine Coast is one of the fastest growing regions and expected to reach 550,000 residents by 2040. Several game-changer projects such as a greenfields ‘smart city’ in Maroochydore, an international airport expansion, a new 15 megawatt solar farm and a new $5bn hospital and health precinct has driven significant investment to the region. A graduate of the University of Adelaide, prior to her current role, Anne has been a Group Manager for Marketing and BD for a CSIRO international joint venture, a former lecturer at University of the Sunshine Coast, and owned her own businesses including a viticultural nursery in South Australia and a coworking business in Noosa. Kirk Drage is the CEO of LeapSheep, a pioneering "Hyper-growth incubation-as-a-service" company that he co-founded upon his return from working for fortune 500 companies in Silicon Valley. Kirk's career has been driven by 3 keen interests; Digital Technology, Scalable Business Models and the Human Condition. A renown speaker and educator, Kirk has a passion for empowering people to develop and mature their abilities to build companies, create jobs, distribute wealth and generate positive social impact. Open State Festival is a festival of collaboration, innovation, ideas and enterprise held in Adelaide, South Australia from 28th September to 8th October 2017. With a focus on the future, Open State connects leading national and international expertise with South Australia business and community organisations to find new ways to solve the challenges of today. Open State was held for the first time in 2016 with more than 65 events hosted by 60 presenting partners, the event attracted more than 25,000 attendances. An ‘Open State’ is a state that welcomes new ideas, from both within and outside its borders, to transform its economy and create new industries and jobs. When communities, governments and businesses work together, they become a powerful force for change. Organised by koolth & AiLab, we are proud to have partnered with Open State Festival to present our exciting event 'Future Jobs in a World of Artificial Intelligence'. This event included a panel of leading figures to discuss AI & future work.